Spotlight on Special Rugs. Highlighting the Variety and Depth of Lida’s Collection. Dark indigo blue is such a frequent dominant (or at least a strong secondary) tone in oriental rugs, that it is both surprising and eye-refreshing when it is absent. 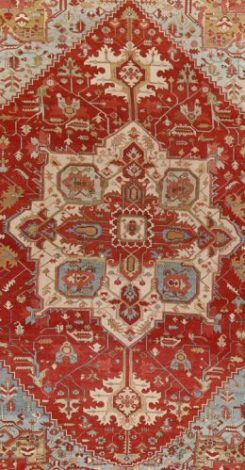 Such is the case with our bold antique Persian Heriz carpet with a palette emphasizing sky blue, ivory and ruby red. 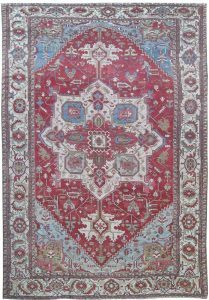 More than any other village or town weave, Heriz area carpets, be they of the Bakshayesh type with allover patterns or more classic examples with medallion and corners layouts, revel in light blue tones: turquoise, sky blue, powder blue, palest blue. Blues are, of course, the product of indigo dyeing, and dark blue is relatively easy to produce; just keep dipping the wool into the pot until the final product cannot get any darker. But light blue hues are tricky. When the wool is removed from the dye vat, it is still natural beige and only darkens to the desired tone when exposed to light. When does one stop? Only an expert knows the secret. Although blue is ostensibly a cold and retreating color, our light blues are anything but. The corners advance and tightly clasp the ruby red field, which, in turn, is anchored by the ecru central medallion. And that is a color harmonic of the generously drawn “turtle” palmette, lancet leaf, rosette and dot framing border. Dotting as a tertiary border element begins in antique Heriz carpets in the later 1880’s and these flyspecks proliferate in the medallion carpets of the 1920’s onward. The medallion and corners style seems to develop simultaneously with the dot infiltration, and our fully developed central motif seems to begin around 1895. A date of c.1900, then, cannot be much wide of the mark. What a happy rug! No pretense, just pure joy. A pleasurable presence. The direct and honest informality of Heriz area weaving requires no education in carpet style history or Persian iconography. Get a big room and enjoy!